Join LIR Raw Bar Service will be in the Canton taproom from 11-7pm on Wednesday April 24th! They will be serving up Duxbury Oyster Company oysters, shrimp cocktail, pickled shrimp, salmon sushiritos and tuna poke bowls. Founded in 2011, Roxy's Grilled Cheese is one of the founding father's of Boston's food truck scene. We serve deliciously melty specialty grilled cheese, hand cut truffle fries, and house made drinks on the streets of Boston and beyond. Join us Thursday, April 25th for another rockin' weekend in Canton with Burgundian Waffles! The crew will be on site vending their incomparable Liege-style Belgian Waffles from 2-8PM. 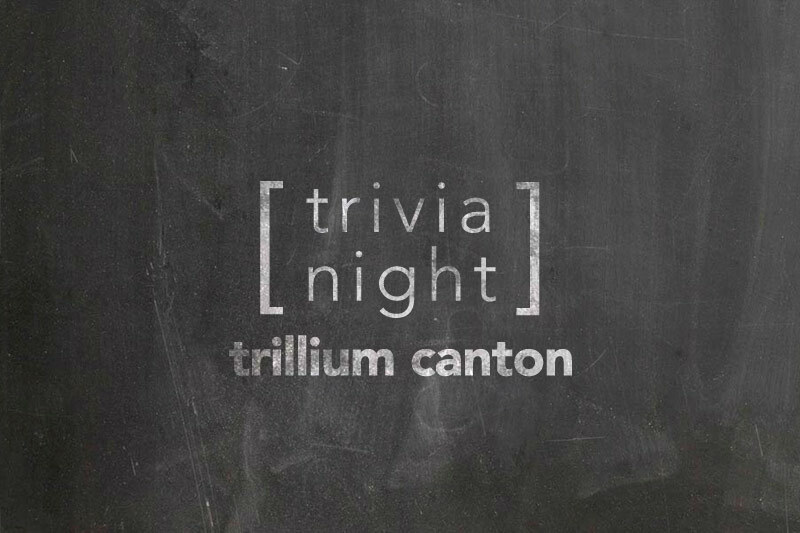 Get your team together and head to Canton brewery's taproom for Trivia Night every Thursday from 6 - 8PM! This series with Host Sean will keep you on your toes! General knowledge questions so don't be shy... all are welcome! And yes, of course, there will be prizes! Trillium Brewing welcomes Reds Street Kitchen with open arms on Friday, April 26th from 12-8PM! In 1872, Walter Scott converted a horse-drawn wagon to serve hot food, becoming the first urban food truck. Soon after, production of similar lunch wagons added covered seating—giving birth to what would become the American diner. As the road-side diner grew in popularity, they took on regional influences, helping define early American cuisine. With the smallest state playing such a large part in Americana, we embrace the history of both street fare & diner classics with unique twists inspired from thestate that started it all. Come join us as we tour the area and explore Red’s Rhode Island! Join us in welcoming Rhode Island's Gastros Mobile Food Company to Canton on Saturday, April 27th from 12-8PM! The only USDA certified mobile food company that specializes in house made charcuterie. Every Sunday we bring back a limited selection of our previously released bottled beer for you to take home! The lineup varies from week to week, so check our social media, or website on Sunday morning for an updated list of what's available. 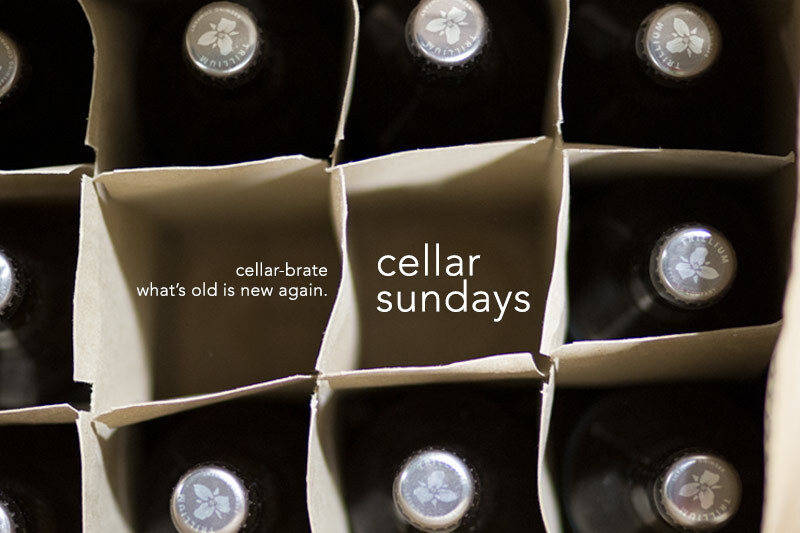 Both breweries (Canton & Fort Point) participate in Cellar Sunday. On Sunday, April 28th we welcome back Pit Master Padraic Keane of Boru BBQ in the Canton Taproom from 12-6PM! He will be slow smoking on-site and vending some incredible options all day long to go with your beers! Knead DoughnutsI joins us in the taproom on Sunday, April 28th from 12-5PM! We are dreaming of fluffy, tasty doughnuts…yum! Knead Doughnuts in historic Providence crafts seasonally inspired and traditional gourmet donuts made with locally-sourced, wholesome ingredients. To get in shape for our upcoming 5K Race, join Alexia Koplewski for a weekly training session! The group will be meeting Tuesday nights at 5:30pm at our taproom (110 Shawmut Rd, Canton MA). This is the third meeting, Tuesday April 30 th at 5:30! This is free event and open for all different skill types from beginner to expert. We welcome back our friends at Oath Pizza to Canton on Wednesday, May 1st from 11am-7pm. They'll be serving up delicious pizza. Treat yourself to real food treated right. Certified Humane, sustainably sourced. Join Mings on Thursday, May 8th in the Canton taproom from 12-8PM! In Khmer, Ming means "Auntie." We craft our dishes from scratch and bring them to you so that every meal feels like it's cooked by family. Ming's originates from our obsession with exploring Southeast Asian cuisine and bringing the wonderful influence of Asian street food culture to Lil Rhody. With Ming's, you'll enjoy the comforting and flavor-packed dishes of street stalls in Phnom Penh, Saigon, and Bangkok right here at home. Authentic recipes created with a barbecue flare are perfect for those on-the-go or with time to savor. Josh and Korn are a couple who's love of cooking Asian cuisine has driven them mad enough to drop the 9 to 5 and start a mobile food business. Korn's parents escaped Cambodia during the Khmer Rouge of the 1970's and settled in Rhode Island, where they raised three children on the food of their home country. These Cambodian favorites, with the influence of nearby countries like Vietnam, Thailand and China have always been close to her heart. Josh learned to cook as a teenager and took a special interest in barbecue. He learned to cook with smoke and loved to grill up feasts for family, friends, and parties. Lucky for him, he found Korn and her infectious knowledge and pride in Southeast Asian cuisine. It is this shared passion that brings you Ming's! Trillium welcomes Melt Food Truck to the Taproom this Friday, May 3rd from 11-4PM. Grab a beer, cheesy sandwich and gear up for Trivia! Trillium Brewing presents live music featuring Brian Thomas Trio on Friday, May 3rd from 6-8PM! We welcome Pennypacker's Food Truck to Canton on Saturday, May 4th from 4-9PM serving up their award-winning slow roasted Porchetta sandos alongside a stacked menu of delectable dishes! on-site from 11-4PM! Come for the seafood.. stay for trivia! "The best seafood New England has to offer is the inspiration behind Shuck Food Truck. Having started our truck in the coastal towns of Massachusetts we are able to work with many local fishermen to bring to you, not only the best, but the freshest Seafood we can find. With the Sea as our inspiration we collaborate with area farms and transform these ingredients into our menu influenced by our roots, classics, and comfort." Certified Buti Yoga instructor Britt Sayward will be teaching Buti & Brews on Sunday, May 5th from 10:15 AM to 12:00 PM. Buti Yoga brings a variety of different movements together, including vinyasa-style yoga, tribal-inspired dancing and plyometric exercises (otherwise known as ‘jump training’). The high-intensity classes are paired with pumping music and are open to people of all fitness abilities. After class, the taproom will be open to enjoy your beer of choice and chat with other Buttisattvas ! One beer is included with the purchase of your ticket. Ticket must be used the day of the event. Please bring your own Yoga mat & Water! (I have extras, message me if you need one) Open to all levels of experience and ability. You must be 21+ to attend this event. ALL THE BACON!!!! 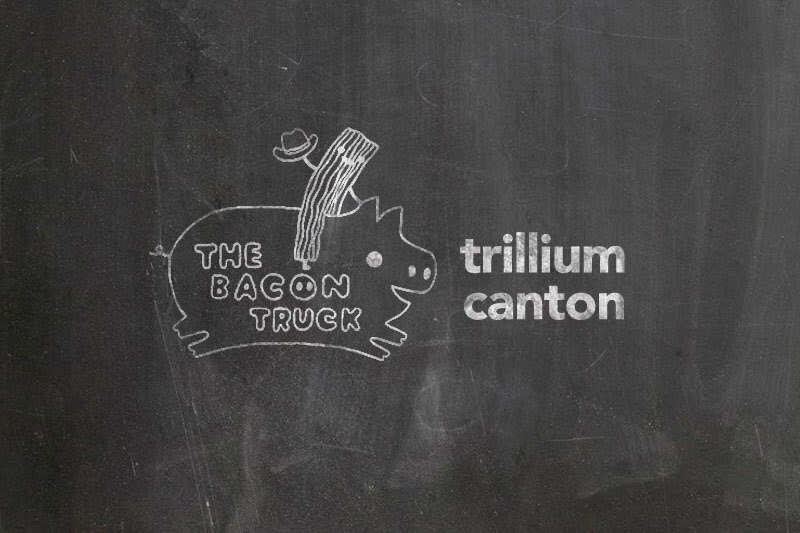 The Bacon Truck is joining us on Sunday, May 5th from 12-6PM our Canton taproom! Join us for beer and bacon everything.. keep your eyes peeled for their menu. This is the fourth meeting, Tuesday May 7th at 5:30! This is free event and open for all different skill types from beginner to expert. Alice's Table will be popping up shop in the Canton taproom on Wednesday May 8th from 5:30-7:30PM. Give Mom a Mother's Day to remember with an evening filled with floral arranging fun! Grab a drink, learn some fun DIY tips to make your blooms thrive, and then take home the arrangement you make! We welcome Spoko back to Trillium on Thursday, May 9th from 12-8! Come enjoy Chef Maciek's delicious Polish eats! Spoko is a pop-up restaurant and catering business combining Polish street food with international influence. Our mission is to recreate our favorite dishes from childhood with modern flair for the 21st century. Our friends at Compliments Food Co. is coming back to Canton on Friday, May 10th from 11AM-4PM! Compliments Food Co. is a locally inspired food truck founded in 2012 and run by brother & sister team Bobby and Andrea MacLean. Expect incredible gourmet sandwiches & delicious fried sides to pair with your beers in the Taproom. 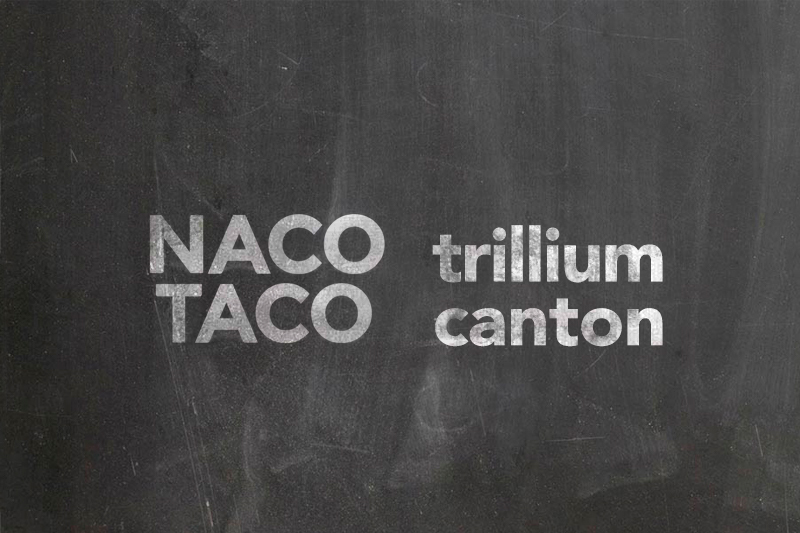 Naco Taco comes to Trillium on Friday, May 10th! Join us from 4-9PM for all things TACO. Naco Taco opened in Cambridge’s Central Square in May 2015, featuring made from scratch tacos, tortas, and sides, served in a casual and lively setting along with margaritas, cocktails, craft beer and wine. In April of 2018, Naco Taco purchased its first food truck, which is open 7 days a week on Newbury Street, and as of January 2019 has now added a second truck for hungry guests at breweries, office parks, and private events. Trillium Brewing presents live music featuring The Oracles on Friday May 10th from 6-8PM! Join fellow yogis in a yoga practice with live music played by DJ Sprino. Beer by Trillium! This 60 minute vinyasa flow class is for all levels and the ticket includes a live DJ and a beer post yoga! Space is limited! Sign up fast! Trillium Brewing welcomes Reds Street Kitchen with open arms on Saturday May 11th from 11-4PM! Join Mings on Saturday, May 11th in the Canton taproom from 4-9PM! This is the fifth and final meeting before the race, Tuesday May 14th at 5:30! Join LIR Raw Bar Service will be in the Canton taproom from 11-7pm on Wednesday May 15th! They will be serving up Duxbury Oyster Company oysters, shrimp cocktail, pickled shrimp, salmon sushiritos and tuna poke bowls. Brato Brewhouse & Kitchen join us in Canton on Friday, May 17th from 4-9PM! This round they’ll be serving up all things MAC & CHEESE! Brato Brewhouse + Kitchen is an up-and-coming Boston-based brew pub founded by Alex and Jonathan, a couple of guys who really love great food and beer, and who are excited to serve their neighbors in the greater Boston area with a thoughtfully designed menu of creative hand-crafted dishes and craft beer offerings. Brato intends to become a cornerstone of the community, sourcing raw materials for their kitchen from local sustainable sources. Partnerships with local farms and fisheries will give Brato access to the fresh meats, dairy, produce, and seafood that will make up the menu items, and although hops and yeast may come from various regions around the world, Brato’s fresh craft brews will frequently highlight local maltsters as they apply to specific beer recipes. LIVE MUSIC With Steve Brandson Band! Trillium Brewing presents live music featuring from Steven Brandson Band for Jazz music on Friday, May 17th from 6-8PM! Join us Saturday, May 18th for another rockin' weekend in Canton with Burgundian Waffles! The crew will be on site vending their incomparable Liege-style Belgian Waffles from 11am-4PM. Lace up your sneakers and join us for our annual 5K run to support Family Reach! This casual and fun race starts from the taproom in Canton, before going on a tour of the local streets and finishing with beers on the patio. 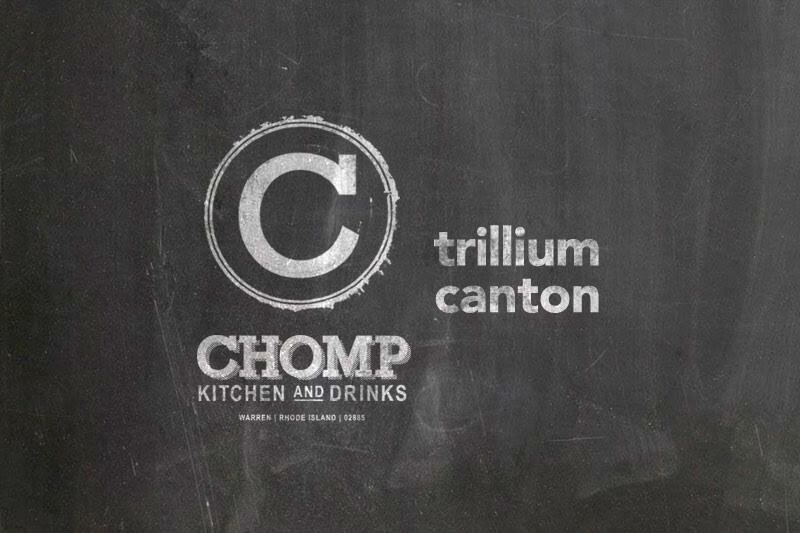 Rhode Island's award-winning Chomp Kitchen & Drinks is back on Sunday, May 19th from 12-6pm! Chomp Kitchen and Drinks is an award-winning restaurant committed to redefining the way our guests think of two comfort food titans, burgers and sandwiches. We continually put forth fresh and inventive takes on refined comfort food as we strive to introduce our guests to new ingredients in an approachable manner using burgers and sandwiches as our vehicle to new culinary exploration. Our culinary team executes a from-scratch menu that has quickly gained the attention of local, regional, and national media through the creative and inspiring renditions of our beloved burgers and sandwiches. Burke Dignam, Trillium's Senior QA Manager, will be taking the stage to discuss quality analysis. Burke has an extensive background in sensory training, identifying off-flavors and ensuring that every beer we package is exactly as intended. Come learn about how we keep quality at the forefront of all we do. Registration for the event includes two 10oz pours of beer that will be paired with the topics at hand. Trillium Brewing presents live music featuring Grayson Ty on Friday May 24th from 6-8pm! This is the second meeting, Tuesday April 23rd at 5:30! This is free event and open for all different skill types from beginner to expert. Meat @ Slims is setting up shop on Sunday, April 21st from 12-6PM! The menu will feature variations of the all beef hot dog notably an "(Almost) Chicago Dog" and one or two other "regional" recipes as well as a Brat sandwich with various german mustard options. On Saturday, April 20th we welcome back Pit Master Padraic Keane of Boru BBQ in the Canton Taproom from 4-9PM! He will be slow smoking on-site and vending some incredible options all day long to go with your beers! LIVE MUSIC With Ulta Vibes! Trillium Brewing presents live music featuring Ulta Vibes a dance party rock band on Friday, April 19th from 6-8pm! Compliments Food Co. is coming back to Canton on Friday, April 19th from 11AM-8PM! Naco Taco comes to Trillium on Thursday, April 18th! Join us from 12-8PM for all things TACO. Trillium Brewing presents live music featuring St. James Place on Wednesday April 17th from 5-7pm! JA Patty of Rhode Island joins us in the taproom on Wednesday, April 17th from 11-7pm! Owners Alison & Conroy will be sharing their elevated versions of Jamaican patties.. vegetarian and gluten free offerings available. We cannot wait! This is the first meeting, Tuesday April 16th at 5:30! This is free event and open for all different skill types from beginner to expert. We welcome Pennypacker's Food Truck to Canton on Monday, April 15th from 11-7PM serving up their award-winning slow roasted Porchetta sandos alongside a stacked menu of delectable dishes! Join us in welcoming Shuck Food Truck back to Canton on Saturday, April 13th Ben & Julia will be on-site from 4-9PM! Come for the seafood.. stay for trivia! ALL THE BACON!!!! The Bacon Truck is back Saturday April 13th from 12-8PM our Canton taproom! Join us for beer and bacon everything.. keep your eyes peeled for their menu. Join fellow yogis in a yoga practice taught by Giovanni with live music played by DJ Sprino. Beer by Trillium! This 60 minute vinyasa flow class is for all levels and the ticket includes a live DJ and a beer post yoga! Trillium Brewing presents live music featuring Tyler & John Duo on Wednesday April 12th from 6-8pm! Quizmaster Sean has something special in store this week: a Game of Thrones themed Thursday Trivia session! Join us in the taproom to prove your knowledge and defend your house. Morrells BBQ of Stoughton will be serving up BBQ goodness on Thursday, April 11th from 2-8PM! Morrell's BBQ is a restaurant, bar, and lounge - a place where family and friends gather to enjoy delicious food in a warm homelike atmosphere. Our menu features delicious wood smoked barbecue meats, including, beef brisket, ribs, pulled pork, and chicken. Our meats are seasoned to perfection and cooked slowly over a wood burning flame until tender. The meats are paired with some of your favorite tasty side dishes including, mac & cheese, collard greens, candy yams, potato salad and coleslaw. We also serve home made desserts such as peach cobbler and apple pie. 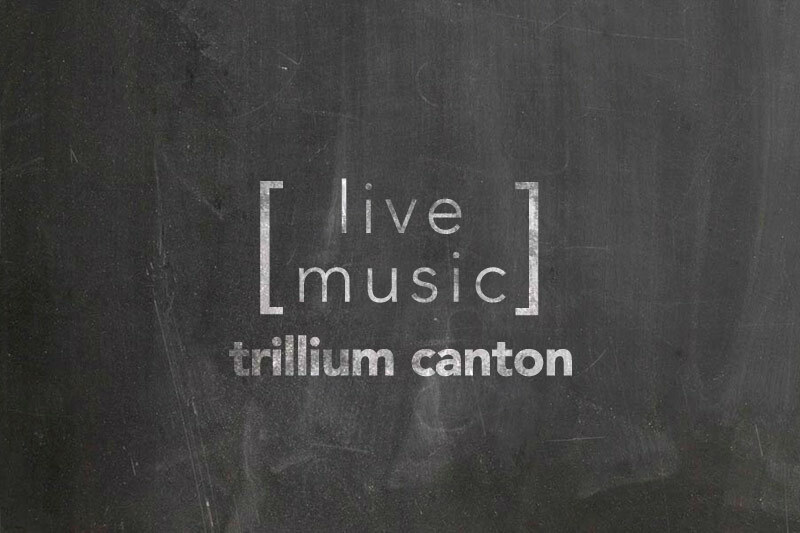 Trillium Brewing presents live music featuring The North Hill Band on Wednesday April 10th! The North Hill Band features Dave Adams on Alto Saxophone, Keiichi Hashimoto on Trumpet/Trombone, Dan Fiori on Keys, Erik Neldner on Bass, Michael Olson on Guitar, and Scott Wilson on Drums. JA Patty of Rhode Island joins us in the taproom on Wednesday, April 10th! Owners Alison & Conroy will be sharing their elevated versions of Jamaican patties.. vegetarian and gluten free offerings available. We cannot wait! Trillium Brewing is teaming up with Bowsers Basement on Tuesday, April 9th from 4-7pm at our Canton location and bringing you video games from 1985 and up. Stop on in for brew and play some classic games from Mario Kart, Super Smash Bros., Donkey Kong Country, Zelda and more! Bowsers Basement which is one of the fastest growing Video Game stores in New England. We just started Retro Game Night as part of our business expansion and are contacting Bars, Restaurants and Breweries to see if they would like to have us host an event at their location. If your interested and have any questions please feel free to contact me back. Retro Video Games are a great way for fun, laughs and good times. A Place for Ace will be in the Canton Taproom on April 7th from 12-5 PM. They will have info about adopting and fostering, dogs that need adoption, raffle items and photos with your dog to raise money for the rescue. Knead DoughnutsI joins us in the taproom on Sunday, April 7th from 12-5PM! We are dreaming of fluffy, tasty doughnuts…yum! On Saturday, April 6th from 12-8PM Master Padraic Keane of Boru BBQ joins us in the Taproom! Boru never disappoints!! Join us in welcoming Rhode Island's Gastros Mobile Food Company to Canton on Friday,April 5th from 11-8PM! The only USDA certified mobile food company that specializes in house made charcuterie.